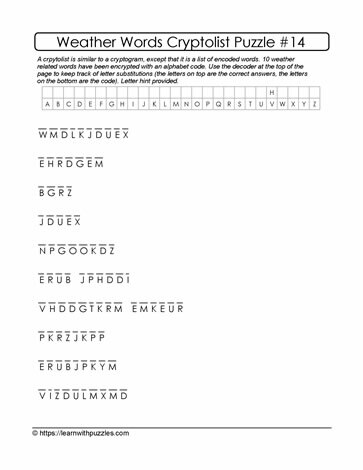 Cryptolist weather words puzzle to challenge the brain. Each word has been encrypted with an alphabet code. Record the letter substitutions in the chart at the top of the page for easy reference. These puzzles suit students in grades 9 and up, and with differentiated instruction, younger grades would benefit from the problem solving challenge. The word based puzzle draws on students' knowledge of common letter combinations, weather vocabulary and their ability to stick to problem solving while using trial and error as needed.